Ancient Egypt’s two Great Divine Magicians are Isis and Thoth. Interestingly, both went on to have rather illustrious careers outside Their native Egypt as key players in the Western Esoteric Tradition; Isis as THE quintessential Goddess of esotericism, Thoth as Hermes Trismegistos, THE quintessential teacher of esoteric wisdom. In fact, the two Divine Magicians have always had a close relationship. Although in earlier Egyptian tradition, Isis is the daughter of Geb and Nuet, Earth God and Sky Goddess, by Plutarch’s time (1st century CE) he is able to say that “many have related that she is the daughter of Hermes,” that is, of Thoth. One inscription calls Her the “vizier and daughter of Thoth.” J. Gwyn Griffiths, one of my favorite scholars, says the two Deities were probably thought to have a family relationship because both were known to be exceptionally wise. As noted earlier, the two are linked by Their wisdom. This wisdom, in turn, empowers Their magic. In fact, both work Their magic similarly—primarily by speaking. The words of Isis “come to pass without fail;” the words of Thoth are “Truth.” At Busiris, Isis is even called Djedet Weret, the Great Word, no doubt because of Her magical ability with words. Both are associated with the wisdom and magic of books. Thoth is the patron of scribes and the Divine author of all books. Isis and Thoth together are credited with invention of hieroglyphic and demotic writing in several of the Isis aretalogies. The Cairo calendar calls Isis “provider of the book” and the Oxyrhynchus aretalogy notes Her skill in writing. And, as She is with so many Goddesses, Isis is sometimes assimilated with Seshat, Goddess of Writing. Both Isis and Thoth are Bird Deities. 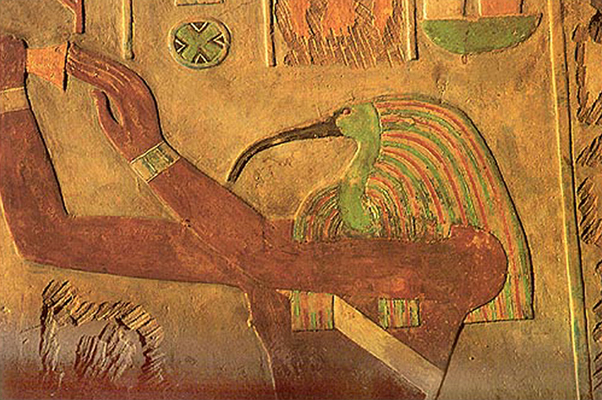 Thoth is so identified with His sacred bird, the ibis, that He never goes anywhere without His bird head. Some scholars think that his Egyptian name, Djehuty, may come from a very ancient form of the Egyptian word for ibis: djhw. If so, this would speak to the ancient nature of Thoth. Isis, of course, is associated with Her sacred raptor, the kite, and sometimes takes on birdform, through She never appears with just the head of a kite as Thoth does with the ibis. In the ancient world, wisdom could also be expressed in cleverness and even trickery. Both Isis and Thoth can be tricky. 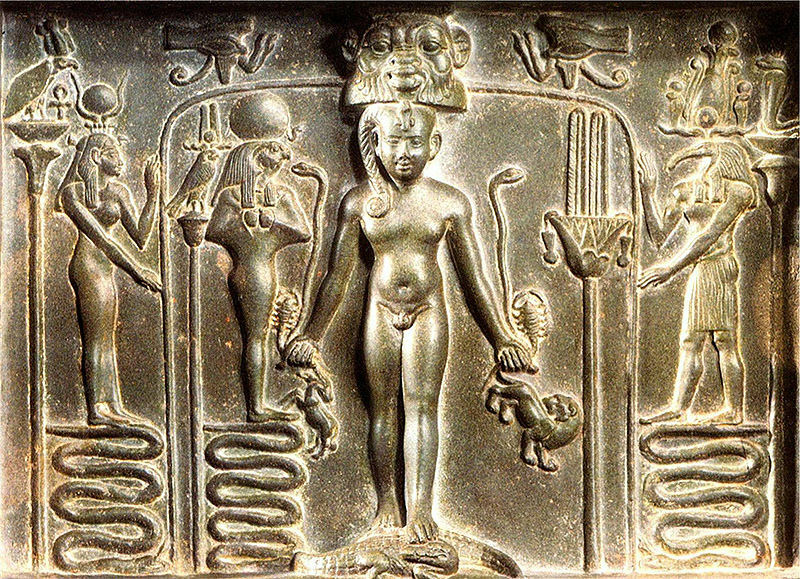 In the story of Thoth and Tefnut, Thoth calms the angry Goddess and lures Her back to Egypt by telling Her amusing stories all the while bringing Her closer and closer to home. 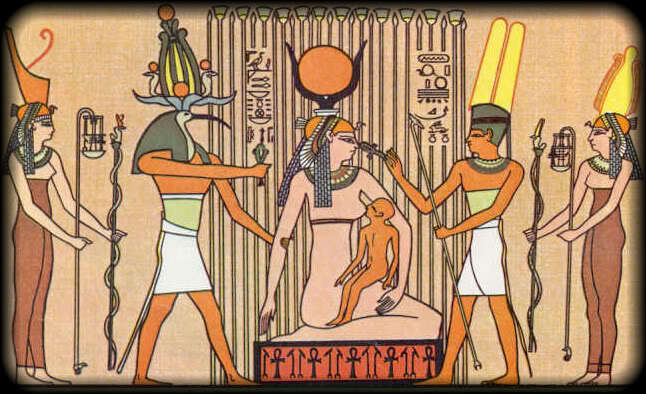 In the story of the birth of Isis, Osiris, Nephthys, Set, and Horus told by Plutarch, Thoth plays a game with the Moon and wins five extra days in the year during which Nuet can give birth to Her children. The myths of Isis have Her tricking Set time and again to ensure that Horus gets His throne. One very interesting aspect of the relationship between Isis and Thoth is that Isis often comes to Thoth for help. In the tale of the “Sufferings of Isis,” Isis has been imprisoned by Set in a spinning house. 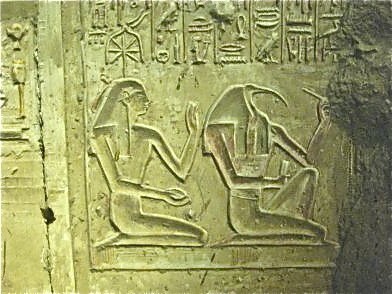 Thoth finds Her and counsels Her (counseling is one of Thoth’s key functions) to escape with Horus to the papyrus swamps, which She does. During the course of the tale, Isis cures the village headwoman’s son of poisoning from seven magical scorpions. (The scorpions were traveling with Isis and got pissed when the headwoman wouldn’t allow the Goddess with Her seven rather scary scorpions in.) Later in the tale, Isis own son, Horus, is poisoned by a scorpion sent by Set and Isis stops the Boat of the Sun to receive magical aid from Thoth. I have often wondered why Isis, Great of Magic, Lady of Words of Power, Greatest of All the Gods, Who Knows Re by His Own Name, would need anyone else’s magical assistance. Perhaps the Thoth-Isis relationship goes back further than we have record of it. If Thoth were the elder Magician, it would make sense to call upon His experience. If Thoth can be considered Her father, calling on Dad for help makes sense, too. Or perhaps we’re seeing an ancient version of something still current among some today. For instance, some say that you shouldn’t do a divination for yourself; you’ll skew the results by being personally involved. Sometimes healers can have trouble healing themselves when they are perfectly wonderful when healing others. Some psychologists, those modern-day shamans, can be perfectly terrible at dealing with their own issues while being a great help to others. Maybe that’s what’s going on in these tales. Sometimes you need a little distance to see clearly—or magically, in this case. It is always during a personal crisis that Isis calls upon Thoth. When Horus is poisoned, Isis is completely distraught and declares that “my heart is adrift.” In such a state, She is not Her magical self. She needs help. As we all do from time to time. In such times, is is well to have friends to call upon as Isis does in Her great friend Thoth. Previous Previous post: So how did the worship of Isis spread throughout the ancient world? Mighty are Isis and Thoth! Thanks to their help and guidance, I earned a B in Chemistry Class! When I found the class especially challenging, I reminded myself that it was a scientific discipline under their auspices. Learning chemistry, then, became sacred work and the information I learned was sacred knowledge. What a blessing to have a peer in your life for a friend, else who will you talk shop with? Reblogged this on Sanctuary Ha Ra.